The burial chamber of king Tutankhamun was, it seems, saved from tomb raiders by a combination of poor memory and natural disasters. Although plundered at least twice in the years after Tutankhamun’s interment, the thieves appear to have taken only a few small objects; further incursions may have been curtailed by floods or rockslides, or simply because the Egyptians forgot it was there. Tut’ was a minor king – the son of Akhenaten – who was forced to change his name when his father’s new religion was overthrown (replacing the monotheist –aten suffix with the preceding polytheistic –amun). There’s probably some irony in the fact that, of all the tombs of all the Pharaohs in the Valley of the Kings, Tutankhamun’s survived largely untouched, while far greater treasures have been lost to the pillaging of petty thieves. Watch brands also have a reputation for pillaging history; often their own. Omega, under the stewardship of the Swatch Group, has developed an apparently timeless design; like Rolex’s Explorer or Submariner models, the Omega Speedmaster has become, in many ways, atemporal. While Omega originally attempted to build on the success of its moon-bound manual chronograph with a series of later iterations (the Mk II, Mk III and Mk IV ranges), the current management appears to be more interested in ensuring that the original Speedmaster design is rooted in a very specific time. A recent Omega-sponsored excursion to Mission Control in Houston celebrating Apollo 13 summed up this approach, exulting the past while the current crop of ISS astronauts almost completely failed to get a mention. 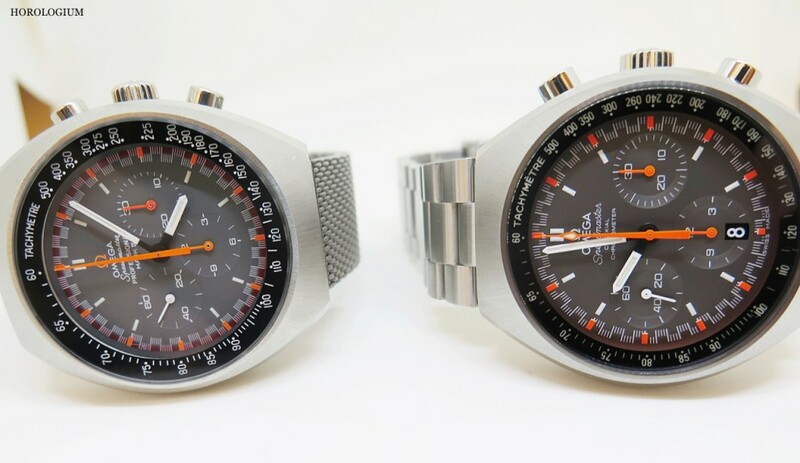 It’s possible that the Speedmaster Professional is the most reissued** watch in history: in the last twenty years (coincidentally since Swatch began their partnership with / sponsorship of the James Bond franchise) there have been at least 25 limited editions, each differing slightly by dial, hands or case markings. However, during this time, the watch’s core design has changed very little. Instead, the three register chronograph has been seared into the minds of the watch-buying public in a very deliberate mental branding exercise***. Omega’s reissues are not just limited to the Moonwatch: recent years have also given us an updated version of the Speedmaster MkII, a “bullhead” chronograph and even a Seamaster 300 (including the now de rigeur Bond version). The manufacturer describes these watches as enhancements, previous designs that have been improved by the addition of a new movement, or a tougher case material. This trend for reissues may be targeted at that part of our brains that appears to want to be connected to the past, yet have all the benefits of the present. I cannot deny the iconic qualities of the Speedmaster Moonwatch, but I do wonder whether there might be something missing. It’s the ever-increasing consumer desire for these “luxury items” that appears to drive both the number of reissues and the sales of vintage pieces: the rise in online sales of pre-owned watches over the past decade has been astounding. With the democratising effect of the Internet, almost anyone with a “passion for horology” can become a second-hand watch salesman (and many have). Provenance is far less important now than ever; it’s common to see watches from lower-traffic ‘sites miraculously appear elsewhere, at hugely inflated prices, but I suppose it’s always been like this – it’s just never been so blatant. 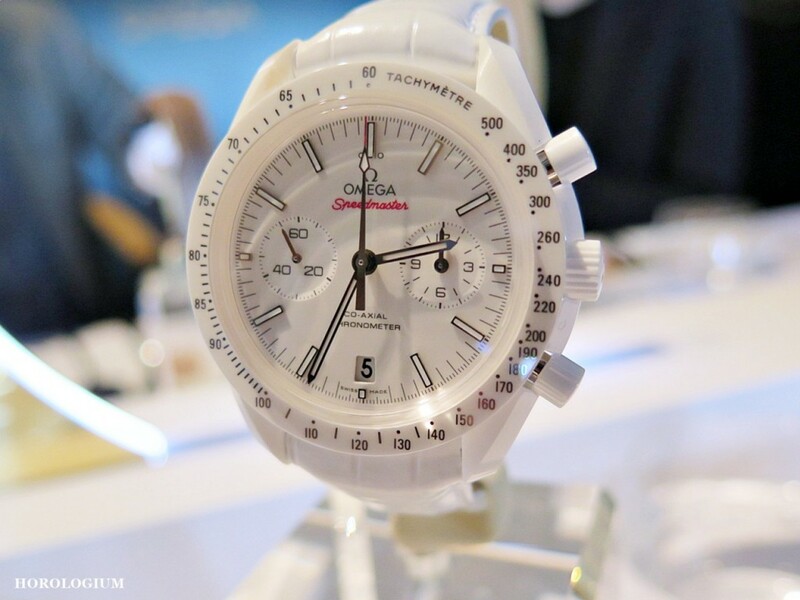 Interestingly, one of Omega’s Swatch Group stable mates has also been ploughing the reissue furrow: Longines. An entire collection of “Heritage” models has been developed, drawing on watches from the first seventy years of the 20th century for inspiration: cushion-shaped cases sit alongside onion crowns, while monopushers replace push pieces for that authentic early “avigation” look. The Legend Diver was one of Longines’ first reissues, shown at BaselWorld in 2007 (although it took a couple of years to come to market). The Legend Diver and its successor models tapped into a rich seam of nostalgia that was also mined by a number of others, most notably the considerable number of micro brands that have produced “homages” to well-known vintage watches^^. Perhaps it was the rise of these small, mostly Chinese- or German-made watch brands that spurred the larger players on, by demonstrating that there was (potentially) a market for official reissues of historic models. While the Longines watches share many of the superficial attributes of the original designs, these watches are – like the Omegas – significantly enhanced. Movements have been upgraded, the water resistance is often increased, acrylic crystals have been replaced with sapphire glass, and, in most instances, the case size has been nudged up a couple of millimetres. So much so that, over the past few years, it has effectively become the norm for Swiss watch companies to announce a re-edition: Tudor’s Monte Carlo; Vacheron Contantin’s Historiques; and Jaeger leCoultre’s Reverso 1931 and Géophysic models spring immediately to mind, while the slightly less well-known Contograf and “Diver Sixty-Five” have recently been reissued by Eberhard & Co and Oris, respectively. Even Patek Philippe has joined in. If I were a betting man, I’d put money on Zenith continuing this trend, perhaps with a new version of the near-perfect CP-2 chronograph (as long as Breitling doesn’t get there first). Whether these watches will eclipse their source material remains to be seen, but if the ever-growing interest in vintage watches is anything to go by, I can’t see this trend ending any time soon. And while this may sound like a bad thing, it most definitely is not. For without this resurgence, this seemingly sudden fascination with all things historical and micro-mechanical, we might not have some of the other things that we’ve taken for granted over the last decade. Take the catchily-named 01 733 7707 4064-07 4 20 18, for example. Oris’ base watch, from which the simulacrum Diver Sixty-Five has been derived, was not a classic: the case design was relatively generic and even the slightly odd numerals were used by Baylor, Timex, et al. However, the release of this watch has caught the imagination of many a #watchnerd, writer and journalist, as well as adding further fuel to the vintage dive watch market, as collectors and online resellers scrabble around to find good examples of unusual models, further pushing up prices. A similar impact might have been seen following the reissue of one of my personal favourites, the ZRC Grands Fonds 300. While this may not be a great time to start collecting wristwatches, it’s a fantastic time to start getting interested in wristwatches. And looking back at past models for inspiration is not a bad way to begin this journey. Many thanks to @Horologium and @InitialJH for the loan of their photos. 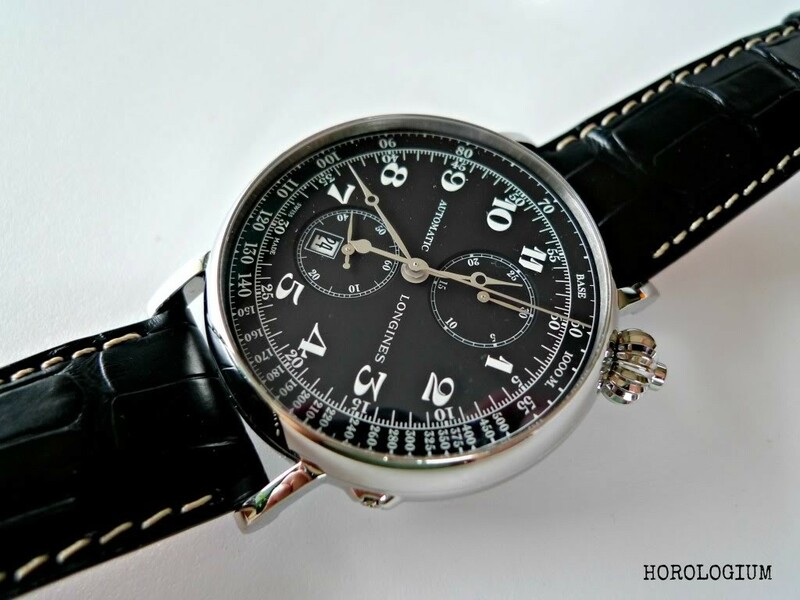 Please visit the Horologium ‘blog for watch industry news, hands-on reviews, interviews and more related to the world of horology. Good article, I think one of the reasons for all the re-issues are the business people leading the business. The big watch houses used to bring out models that were either ahead of their time or just ahead of anyone’s time. These then become the rare collectables today which then become the re-issues. They just don’t want to take the risks they used to take and loose money having fun or trying something different. You’re probably right. “Vintage” or other pre-owned watches are certainly big business now. I saw a watch the other day that had sold on eBay in July for $2250 and is now on a “specialist” ‘site for $3850. Good money if you can get it. My fascination with the older version of historic watches is the wear on the pieces. I can see the lives of the previous owner in every scratch. Can not find that in a new watch. Thanks for your interesting blog. Thank you for your comment and thank you for reading the ‘blog. I completely agree – wear and tear is all part of the charm of vintage watches, as is their honesty. There was an interesting approach taken to this by Giles Ellis at Schofield last year: he tried to “pre-patinate” his Beater watches, by giving them an already lived-in look, that should continue to develop over time. Nice to see a new brand thinking along those lines. I like the fact that a watch is designed to be a”beater” but in reality there are many interesting lower priced quality watches that a person can designate a beater and that are sturdy enough to take that beating and develope the character we like in our vintage pieces. Only problem being I don’t have enough life left for the time it takes to accomplish this. Another problem with getting old. At least I can enjoy pieces that other people have aged for me. Thanks again for an erudite blog.